Just had a fun tour a few days ago in wine country in Southern California. I love wine, though sometimes I'm not sure how knowledgeable about it I am. Plan to visit you frequently. The Tuscan wines have always been my favorite. 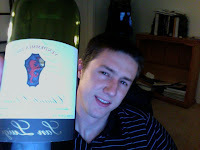 I have enjoyed to San Luigi 2003 and have found it to be among the best. Now waiting for the 2006, which should be a banner year for Tuscan wines. Maybe the best since '99.